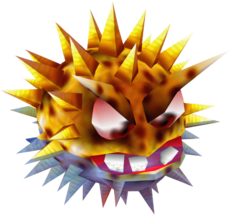 Puftoss, also known as Blowfish Baddie, is a massive yellowish Puftup and the boss of Gloomy Galleon in Donkey Kong 64. His physical differences from a normal Puftup include three jagged teeth on his lower jaw, larger eyes with brown pupils and light pink eyeballs. Lanky in a boss fight against Puftoss. To fight Puftoss, the Kongs must feed 250 bananas to Scoff at the Troff 'N' Scoff location, allowing Troff to unlock the boss door. Lanky Kong is the Kong who is selected to fight the boss. After entering the boss door, Lanky finds himself in a dark, isolated galleon area. He is sitting inside of a small motorboat shaped like a coconut half. For a few seconds, Lanky casually looks around and scratches himself. The screen turns to a silhouette, which lets out a grow. Lanky falls backward, then tries observing the source of the growl. Lanky gets scared and turns on the boat's light to help him identify the source of the growl. After waving in front of the light, Lanky notices Puftoss right in front of him, directly staring at him. Puftoss lets out a loud roar, and Lanky falls backward in shock. The battle then begins. Puftoss only sits in the center of the pool during the battle, and does not move his body around. He only changes direction, by attempting to spit fireballs at Lanky as he drives around in a motorboat. Lanky's goal is to bring electrical poles out from the water by driving each DK stars. A 30 second timer appears when he drives through the first DK star, and resets back to 30 when he drives through the next, and so forth. After driving through the fifth star, the fifth pole rises out from the water, and they create an electric current that electrocutes Puftoss. If the timer runs out, the poles retract back into the water, and Lanky has to redo the whole process. Lanky does not get injured if he hits into Puftoss, which is unusual for a boss fight. Puftoss gets electrocuted from the poles. Puftoss's pattern changes for every round: in the second round, he shoots out four fireballs and then ground pounds into the water, which creates a pair of two blue shockwaves. Lanky can avoid the shockwaves from either a well-timed jump or by going to the very edge of the arena, as the shockwaves disappear when touching the electric poles. To add to the difficulty, the DK stars get smaller for each round and the countdown timer decreases by an additional five seconds: starting with 25, then 20, followed by 15, and lastly 10 seconds. After driving through the five DK stars and electrocuting Puftoss again, he adds another attack to his pattern for the third round: spitting a large fireball in the air, which divides itself into smaller fireballs that rain onto the arena for about ten seconds. In the fourth round, instead of creating a shockwave, Puftoss spits out a Puftup which explodes on impact. If the Puftup does not crash into an object, it still explodes automatically after 13 seconds. Puftoss retains his pattern for the fifth round, except in a different order: he shoots out five fireballs, then a Puftup, then five more fireballs, and finally causes it to rain fireballs. After being electrocuted a fifth time, Puftoss is defeated, as it inflates too large and bursts. Puftoss flies around the arena while letting air out from his mouth, causing him to deflate in size. After losing all of its air, Puftoss is reduced to being small and flat, and it slowly floats down to the water. Just when it hits the water, Puftoss vanishes, and the Boss Key on the water surface for Lanky to collect. Puftoss as shown in the game. This page was last edited on January 27, 2019, at 15:03.